I read a recent blog post which made the claim that “In the past 25 years, only lip-service has been paid to SD, particularly around the use of fossil fuels.” I don’t agree – I believe that we’re much further down the track than most people know. 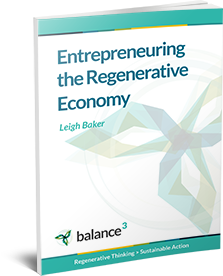 To me, the past 25 years have been the design phase of developing a regenerative economy. Increasingly, those designs are being translated into innovation in the built and made environments. So I’ve started putting together a list of the developing principles and practices of Regenerative Thinking as I understand them. It’s important to publicise what HAS been happening. We’re facing the ‘chasm’ of innovation adoption (see our earlier post on innovation diffusion), and we’re well on the way to crossing it. What’s needed now is to convince ‘the majority’ that there’s action worth taking sooner rather than later – that sustainability is a REAL win/win/win option, with over two decades of design and implementation already accrued. Given the existing ‘brown’ economy has been steaming ahead from the time of the industrial revolution, it’s not surprising that it’s going to take some time to change course (and possibly even more time for mainstream media to notice and report on it). Here’s a sampler of what I’ve noticed that’s been happening over recent decades – indicators that a range of businesses and other organisations are acting to develop truly sustainable solutions. Everett Rogers publishes “Diffusion of Innovations”. The Club of Rome is founded as an informal association of independent, long-term thinkers sharing a common concern for the future of humanity and the planet. Donella H. Meadows, Dennis L. Meadows, Jørgen Randers and William W. Behrens III publish “The Limits to Growth” about the findings of computer modeling of unchecked economic and population growth with finite resource supplies. The WCED (World Commission on Environment and Development) is formed – an organisation independent of the UN to focus on environmental and developmental problems. The WCED publishes “Our Common Future” (also known as The Brutland Report) identifying that the many crises facing the planet are interlocking crises of a single crisis of the whole, and that there is vital need for the active participation of all sectors of society in consultation and decisions relating to sustainable development. Karl-Henrik Robert founds The Natural Step in Sweden, setting out the system conditions for the sustainability of human activities on earth, based on systems conditions derived from the Laws of Thermodynamics. Kenny Ausubel coins the term Bioneers to describe an emerging culture of social and scientific innovators who explore living systems to understand how nature operates and how to mimic “nature’s operating instructions” to serve human ends without harming the web of life. IKEA holds their first environmental day. Peter Senge publishes “The Fifth Discipline“, outlining his concept of Learning Organisations and the structures and patterns of systems thinking. Geoffrey Moore publishes “Crossing the Chasm”. Rio Earth Summit – the Agenda 21 action plan of the United Nations in regard to sustainable development formed, and many countries sign on voluntarily. William McDonough and Michael Braungart publish “The Hanover Principles” – on designing buildings and objects with forethought about their environmental impact, their effect on the sustainability of growth, and their overall impact on society. Paul Hawken publishes “The Ecology of Commerce: A Declaration of Sustainability”, describing key principles of regenerative business. William McDonough and Michael Braungart form McDonough Braungart Design Chemistry consulting company. Gunter Pauli establishes the Zero Emissions Research Initiative (ZERI) Foundation to explore strategic levers to develop true sustainablity. Janine Beynus publishes “Biomimicry: Innovation Inspired by Nature“, describing how Nature’s 3.8 billion years of design brilliance can be applied to sustainability innovation. Ray Anderson publishes “Mid-Course Correction. Towards a Sustainable Enterprise: The Interface Model“, reporting on the first stage of the Interface experience in “climbing Mount Sustainability”. Janine Beynus co-founds The Biomimicry Guild and the Innovation Consultancy. 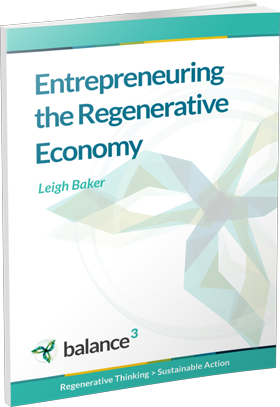 Paul Hawken, Amory Lovins, and L Hunter Lovins publish “Natural Capitalism: Creating the Next Industrial Revolution”, describing the principles and practices that will enable a regenerative economy. Ford Motors – in conjunction with William McDonough – begins redevelopment of it’s Rouge River Complex, investing $18 million in a green roof and natural water purification processes to avoid the installation of a $50 million mechanical treatment facility. UK Borough of Working is awarded a Queens Award for Enterprise: Sustainable Development for the development of local sustainable community energy systems which use co-generation and other technology to reduce emissions by 80%. Steve Moriss establishes Close the Loop cartridge recycling in Australia, offering to take back and recycle all the printer and toner cartridges supplied, promising ‘zero waste to landfill’. Michael Braungart and William McDonough publish “Cradle to Cradle: Remaking the Way We Make Things” an economic, industrial and social framework that seeks to create systems that are not only efficient but also essentially waste free. Janine Beynus founds The Biomicry Institute to promote the study and imitation of nature’s remarkably efficient designs and bring together scientists, engineers, architects and innovators who can use those models to create sustainable technologies. Richard Branson and Virgin announces the Virgin Earth Challenge. Australia’s Close the Loop opens a plant in the USA, expanding their cartridge recyling business internationally. Ray Anderson publishes “Confessions of a Radical Industrialist. Profits, People, Purpose – Doing Business by Respecting the Earth“, documenting Interfaces achievements over 15 years. These included: 60-80% reductions in environmental impacts AND increased sales, earnings and profit margins. Australia’s Linfox announces their sustainability goal of 50% GHG reductions by 2015 based on 2006/7 emissions. Ellen Macarthur establishes a foundation to promote The Circular Economy as a genuine economic paradigm shift, partnered by B&Q, BT/Cisco (working together), National Grid & Renault. MDBC turns Cradle to Cradle product certification over to an independent non-profit called The Cradle to Cradle Products Innovation Institute. The Ocean Alliance holds the first Plasticity Forum in conjunction with Rio20+, showcasing sustainable, innovative solutions related to the use of plastic and market opportunities for transforming plastic waste into a valuable resource. Puma releases its first Environmental Profit & Loss Report. Australia begins its National Television and Computer Recycling Scheme to provide Australian householders and small business with access to free recycling services for televisions and computers, printers and computer products. The Natural Capital Declaration is launched at Rio +20, developed from the United Nations Environment Programme Finance Initiative and signed by CEOs of a range of global banking organisations. Sustainia releases the first Sustainia 100 report – a guide to 100 innovative solutions from around the world that presents readily available projects, initiatives and technologies at the forefront of sustainable transformation. World Resources Institute publishes a Sustainability SWOT (sSWOT) previously tested by Danone, Staples, Target, Wells Fargo and others. 33 major U.S. companies, including eBay Inc., Nike and Limited Brands sign a“Climate Declaration” highlighting the American economic opportunity of responding to climate change and urging strong government policy action. China indicates interest in a circular economy in the official newspaper, The People’s Daily. Interface announces a pilot program to collect ocean fishing nets and turn them into carpet. William McDonough and Michael Braungart publish “The Upcycle: Beyond Sustainability – Designing for Abundance“. Waste Management Inc. and MBDC form a Sustainable Innovation Collaborative to address the waste impact of consumer goods. Inaugural World Forum on Natural Capital held, building on the significant private sector interest shown at the United Nations Earth Summit in Rio in June 2012 and developments since then. Sustainia releases its third report on its Top 100 innovative solutions from around the world presenting readily available projects at the forefront of sustainable transformation. Paul Hawken and Amanda Ravenshill announce the formation of Project Drawndown, with the goal of global cooling by 2065. Project Drawdown is a book, a digital platform, and open-source database identifying the beneficial financial, social and environmental impact that ‘state-of-the-shelf’ solutions can deliver now to begin the journey to global cooling. Project Drawdown releases DRAWDOWN: THE MOST COMPREHENSIVE PLAN EVER PROPOSED TO REVERSE GLOBAL WARMING. Global Sustainability Explorer releases 300 Sustainable Development Goal business solutions.